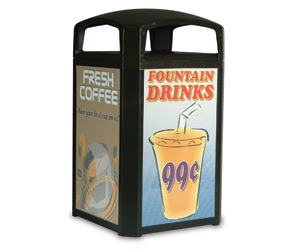 Generate revenue by selling advertising space or promoting products on your 50 gallon waste container. The high-impact acrylic panels supported by rigid poly backing for durability and weather resistance. Tamper-resistant frame discourages vandalism of advertisements. The hinged hood and stay-open strap provides easy access to the rigid leak-proof plastic liner. These Landmark Series® Classic waste receptacle kits are available with several versatile options designed to suit your needs. The following is the easy 2 step ordering process instructions. (B) of Landmark Series® Classic complete waste receptacle kits you would like to order. Panels and Top, Base & Frame Kits will appear as separate line-items on the order form.